The CVRG’s Fisheries Committee stays on top of issues effecting sport fishing both locally and province-wide. 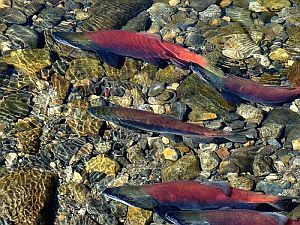 In the last few years the Club has worked with the Fish & Wildlife Conservation Programme to enhance kokanee spawning by placing gravel in Boulder Creek and fencing to prevent cattle from entering the creek in sensitive areas. The B.C. Wildlife Federation is constantly at work defending fish habitat in the Province and defending the sports fisherman’s share of the catch from other user groups who want a larger share. In particular, a major battle fought on our behalf has been over halibut quota. If you believe there are important issues in regard to sports fishing, contact our chairperson and get involved in club activities.